These installation tips are specially meant for electric ball valves from the BW series of JP Fluid Control. Before starting the installation, please read the safety instructions carefully and verify that the electric ball valve is suitable and safe for the application. Check if the valve specifications on the type label on the actuator match with the application requirements. 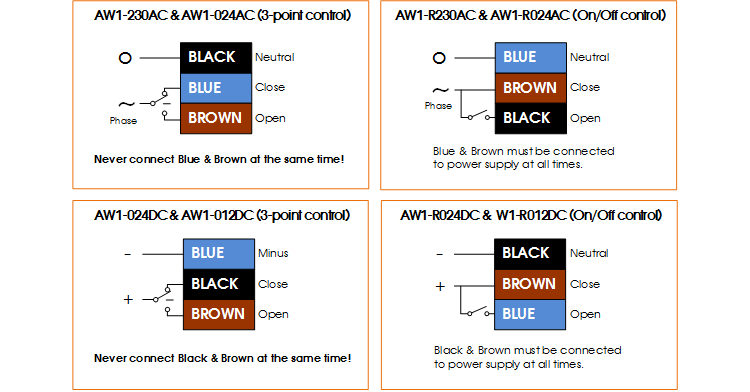 The image below shows an example of a label with an explanation of the various parameters. The actuators of the AW series are splash proof, but not resistant to severe weather conditions. It is therefore advisable to install electric ball valves in a dry, sheltered spot. Make sure that the piping is not under pressure and cooled down before you start. Check the pipes for dirt and clean the pipes if necessary. Ball valves are less sensitive to dirt than solenoid valves, but it is still advisable to avoid dirt if possible. Dirt may increase the wear of the valve. Optionally you can install a pipe filter on the inlet side of the valve. Use thread sealant such as Teflon tape or Loxeal for the pipe thread. Avoid entry of the sealant into the valve as this may lead to blockage. Use the correct fittings between the valve and the pipes. While tightening, only excert force at designated areas on the valve, never exert force on the actuator. Avoid stresses in the piping and fix the pipe securely to the wall or frame to avoid vibrations in the pipes. The valve must be securely fastened to the pipes using the right type of fittings. Use a wrench for both the valve and the pipe while tightening. Prevent unnecessary stress in the system. It is recommended to install the valve with the actuator facing upward with a maximum deviation of 90 degrees (see picture). This reduces the risk of collecting moisture in the actuator. Set the ball to the correct angular position, for example with a wrench. 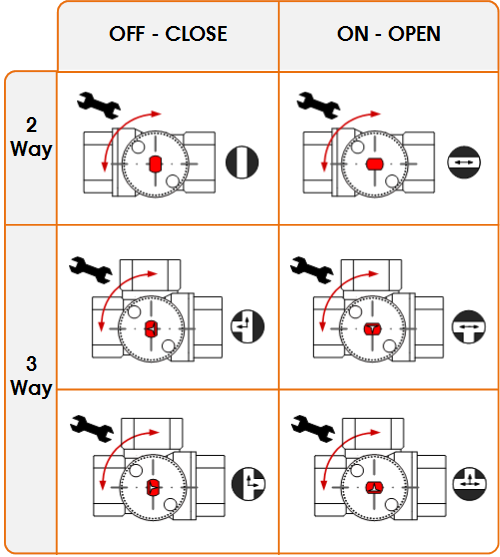 The 2-way ball valves are closed in their standard position. The 3-way ball valves can be set up in two different ways by rotating the ball 180°. 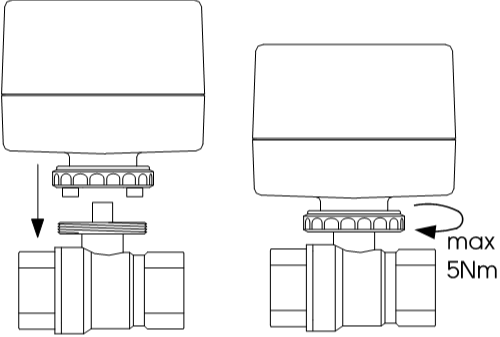 The following diagram shows how the 2-way and 3-way valves can be used. Make sure that the position of the ball in the valve is properly adjusted, so the actuator fits on the valve. Tighten the nut of the actuator by hand. Check the actuator type and use the correct wiring diagram. Improper connection of the wires or using a wrong voltage can cause permanent damage to the actuator! The rotational direction of the actuator can not be changed by reversing the polarity of the control wires. The actuators are equipped with two internal end switches. Therefore, energy is only consumed during opening or closing. The AW1 actuator (JP Fluid Control) opens and closes electrically. There is no spring in the actuator. Ensure that drops cannot slip along the cable and enter the actuator.